About a year ago, November of 2013, I already started thinking about a costume for Blizzcon 2014. Must be able to Sit Down. I started thinking about a cloth set from the World of Warcraft Cataclysm Expansion, that, from the moment I saw it, thought was very cool. This design had a few different color combinations; red and black, white and gold, white and purple, and grey and black. I settled on the red set pretty early, even though in-game this particular combination didn't have its own name, I started calling it "Crimson Embersilk Battlegear". 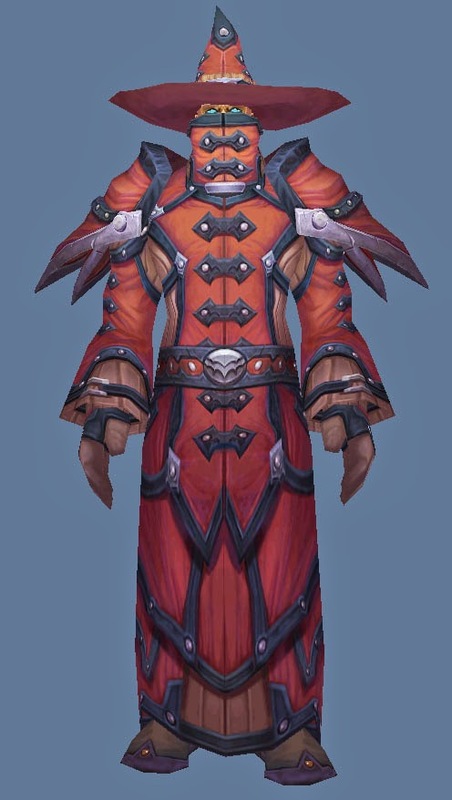 And I started to think I could incorporate a light show similar to hoodie into the costume that would stand out nicely in the darkened main hall of Blizzcon. So I broke the costume down into two projects; the robe (including the giant hat) and the light show. I wanted to be sure the costume itself was good enough that if I couldn't figure out how to do the lights, it would still be perfectly good to wear. I wanted the lights to enhance the costume, I didn't want them to look gaudy or for anyone to think I just slapped LEDs on it because it was a thing to do. Very cool. I never knew what your inspiration for the light show was, since the red Embersilk gear doesn't have large gems or an aura on its own.